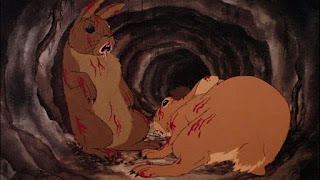 Lest you think that all the movies shown in the Cosy Apartment are in black and white and from the 1940s, I would like to tell you about Watership Down, the animated film based on the 1972 best-selling novel of the same name. The book is one of my favourite works of fiction, and the subsequent movie is true both to the story and the spirit of the book. The movie is about a small group of rabbits who, inspired by the premonition of one of their number that their warren (colony) is doomed, set out to find a new home. They encounter danger and hardship almost every step of the way but eventually reach a lonely ridge called Watership Down (a real place in England, as are most of the other locations). There, the rabbits begin to build their new lives, thinking tribulation is behind them. They are wrong. It sounds innocuous. The fact that the characters are almost all bunnies, and that the movie is animated, makes it seem perfect family fare, fit for children of all ages. But this is not a movie for children. The tag-line of the film was “The whole world will be your enemy…and when they catch you, they will kill you. But first they must catch you.” This is uttered by Lord Frith (the sun), treated as a god in the rabbits’ mythology. He knew of what he spoke. 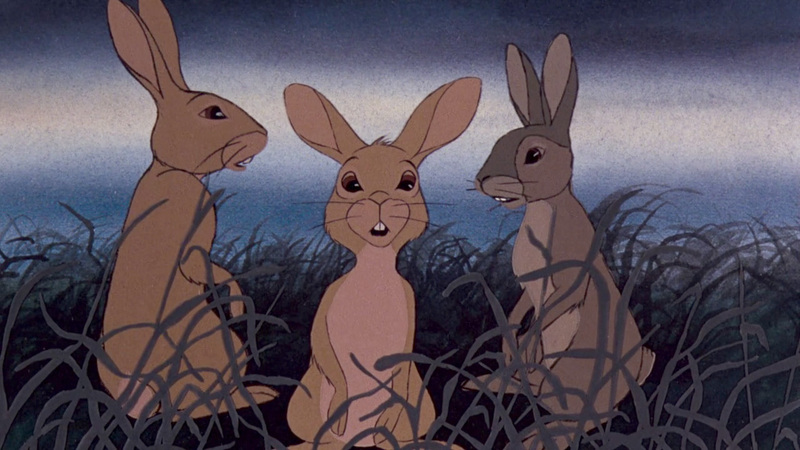 Though elements of the film are violent, the bit of a reputation Watership Down garnered because of them has obscured its full nature. The truth is that the movie, like the book, is about real rabbits. They don’t wear waistcoats and have tea, as delightful as that is. These rabbits are concerned almost exclusively with survival. They worry about food, producing offspring and, when they must, fighting. This is an adventure film, with involved dialogue, stories within stories and hair-breadth (hare-breadth?) “ ‘scapes in the imminent deadly breach”. The violence when it comes may be shocking but serves a purpose, reminding us that nature is not all lush meadows and soft summer nights. There is a surreal scene depicting the destruction of a rabbit warren by poison gas. When I saw this scene in the cinema, a child, not much younger than I was, literally ran screaming up the aisle. But it wasn’t until I was older that the impact of the scene struck me, and I realised the terror felt by animals dying in such a fashion. Though it uses animals, being animals, the story becomes almost epic in scope; despite originating as a tale to keep two young children occupied on a road-trip, it could hold its own against the exploits of Greek legend. 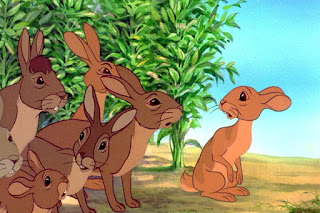 The result is a movie in which rabbits act like rabbits, yet could represent human interaction. The author of the book, Richard Adams, even devised a mythology for the rabbits which includes a god, spiritual beings and folk-heroes. (The movie conflates, no doubt deliberately, in the interests of time, the lapine hero, El-hrairah, with the Black Rabbit of Inlé (death)). The characters are well-drawn and three dimensional, and each of the main ones have distinct personalities, enlivened by excellent actors, including John Hurt, Richard Briers, Harry Andrews, Hannah Gordon and Zero Mostel. The animation is simple, but skillful, in a way that is not seen anymore. The backgrounds are beautiful water-colours. 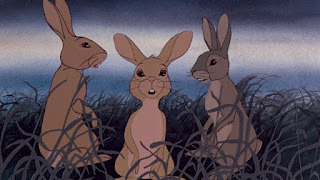 While I recommend the novel above the movie, this is a review of films and not books, so instead, I give the movie Watership Down a high rating. But don’t let little kids see it. 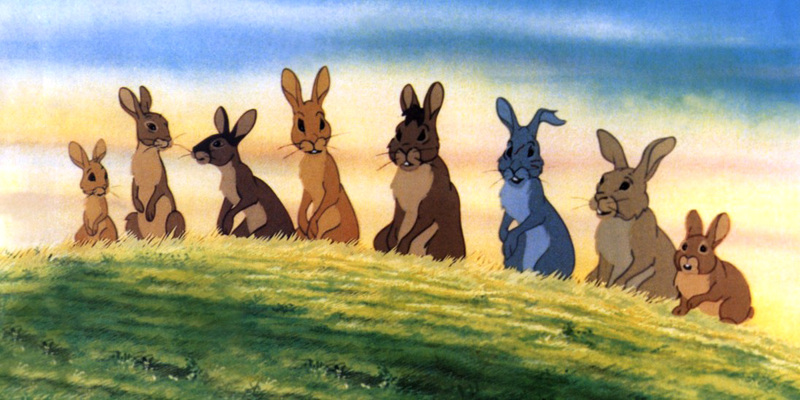 There was also a "Watership Down" tv series, and there is talk of re-issuing or re-making the movie, 'improved' with computer graphics. Sigh. 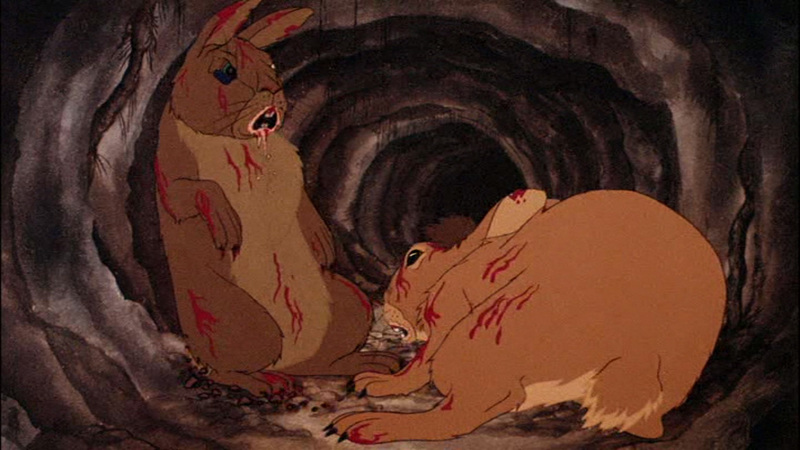 I never saw Watership Down when I was young, but your review makes me want to watch it now. According to Amazon Lite (or "Amazon.ca as they call themselves) I have a choice of the Criterion Collection for $50 or I can get lost. Maybe one day.